Hatters chief Nathan Jones admitted he had been about to bring off goalscorer Olly Lee just before the midfielder netted Town’s equaliser at Carlisle United on Saturday. With just over an hour gone, the 26-year-old was on hand to slot home from close range after Danny Hylton’s cross-shot was parried by Cumbrians keeper Jack Bonham, making it 1-1. Town had trailed in the first half, Danny Grainger putting the hosts in front from the penalty spot after James Shea brought down Richie Bennett. Lee might not have even been on the pitch though if Jones had gone through with his plans, saying: "There was no arguments about that (the penalty) but it was our start really, as we didn’t get off to the best of starts. "We weren’t pressing, they matched us up, went to a diamond and they outbattled us a little bit and out grafted us. "We didn’t get on second balls and we defended a little bit deep and that ultimately culminated in the goal. "Once they got that, we were the better side and we came out a little bit, started to play a little bit more, as I said second half, we’ve got use our width slightly more and we did that. On whether he knew he was about to be replaced, Lee said: “He told me at the end there, which was nice of him! 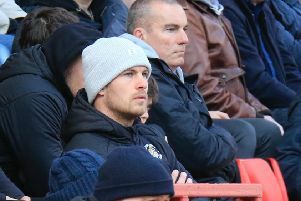 Lee's goal ensured that Town would be playing League One football next season, as with Exeter held by Crawley at home, a point was all the visitors needed. Despite winning the EFL Goal of the Season award for his stunning 70-yard strike against Cambridge, the former West Ham man knew this had carried more significance. He continued: “Yes, definitely, this was more important, it was a great moment, a goal we needed and thankfully I was there to put it in and it’s been a great day for the boys. “It was just a chance to get a clean strike and hit the target. I think I can score goals, I haven't scored for a little while and have been a bit frustrated with that, so I’ve been doing a bit of extra shooting and thankfully it’s paid off. Town did have opportunities to claim all three points, none more so than when Pelly-Ruddock Mpanzu went through only to be denied by Bonham from close range. Jones added: “You never know with Pelly, I’d have preferred him to have it from about 80 yards out and to have a shot.